Offering “no frills, just a good, traditional high quality deli”, this Great Neck kosher establishment has “been around forever” (same ownership for over 40 years) and Home of the “Paulie Special.” Consistently coming through with delicious corned beef, pastrami, brisket, and other “traditional” eats. “Corned beef sandwich was the best I have ever had. Coming back for the brisket.” “The best hot dog on Long Island.” There’s “minimal seating” available, so many carry out their knishes while lamenting that the “landmark” is the “last of a dying breed. “This is a true kosher deli. From pastrami to latkes this place is as it should be. Great soups too. Try the brisket it does not need a knife.” “Corn beef, Pastrami and Brisket - doesn't get better than this! Hebrew National hot dogs, knishes and so on...like the good old days. 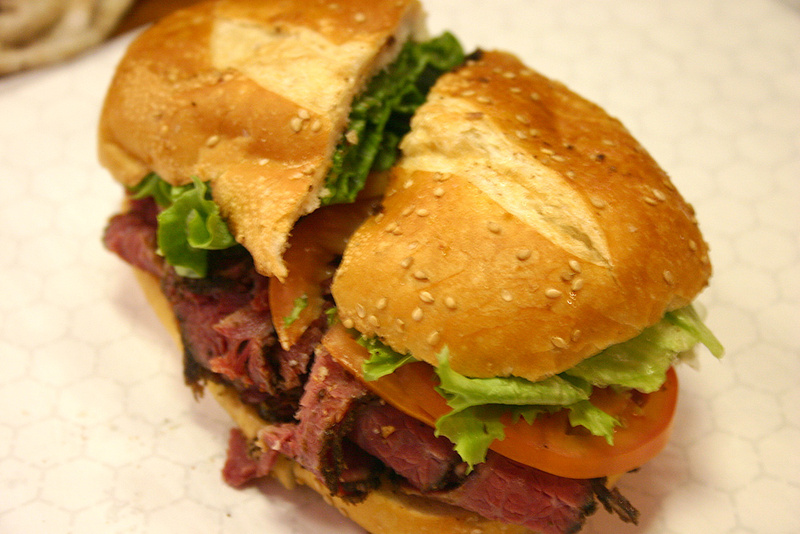 Time stands still at Kensington.” “Love stopping by for a fantastic sandwich piled high with pastrami, corned beef or turkey. Top off with a knish (ask for Paulie Special) and a grilled hot dog and you are set! Love that it has been here for years and you can count on the quality and the taste you will crave often! The Kensington Kosher Deli is hands down the best kosher deli I have ever been to. They make kosher meats in a beautiful traditional style and heap huge amounts of it onto delicious rolls, I wish I could have one right now. Everything in this place is great, I would never go there without getting a brisket sandwich to go for later. - Patrick W.
This is one of my favorite places for lunch ever. I habitually made drives of 30-40 minutes just to get a hot dog or put someone else onto the magic of KD. First of all, the hot dogs are incredible - natural casing so you get that snap that you usually find at a kosher place. As far as I'm concerned, the macaroni salad and mustard hot dog was created here, it's not on the menu but ask for it. It is absolutely fantastic. The brisket sandwich is out of this world, have had trouble finding one like it in Manhattan. They have one of the best chicken cutlet sandwiches I've ever had, perfectly crisp and golden crusted - I used to buy 10 and freeze them for college. Make sure you get some well done fries and some Russian dressing, perfect snack while you wait for your food. Service is extremely friendly, and even though I highlighted the hot dogs and sandwich, you can't go wrong at this deli. Really one of the best in the world. - Justin C.
This is the real deal. Pastrami, corned beef, brisket, just how you like it. Sides outstanding, too. Best deli on LI for the food. Paul, Phil and Simon always treat you like a friend, and they're good friends to have. Go for my personal favorite: Corned beef-pastami combo, mustard and cole slaw. Potato pancake a bonus to add to your weight and your risk of fatal myocardial infarction, but it's worth it. - Mark R.
Seriously, this place is what most other Jewish delis aspire to be. Love their hot dogs and chopped liver on rye. This delicious deli that made me miss home when I went to college. Plop down, have a cherry Dr. Brown's and a sandwich with full-sours on the side. It'll be the best nosh you ever had. - Emily R.